Matias are well known for their classic Mac-style keyboards, but they’re also innovators – Edgar Matias made his name with a one-handed keyboard, and recently the company developed a Quiet Click switch that has been used to great effect in its recent keyboards. It’s no surprise then, that Matias have a few more projects in the works. 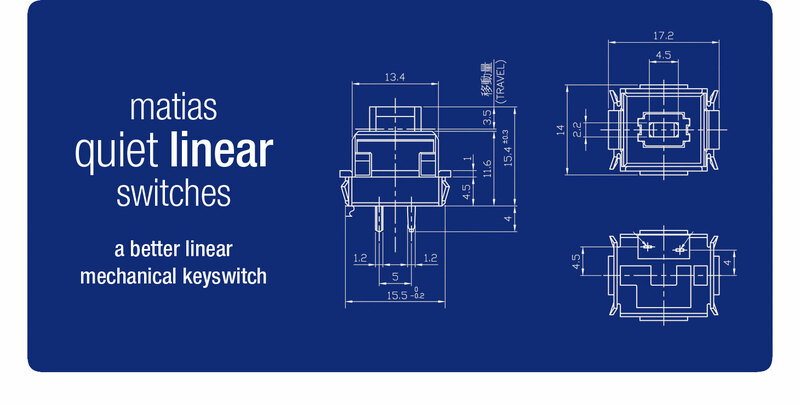 Today we’re going to introduce two: their redesigned linear switch and a 60% size keyboard. Matias linear switches were developed for the Open Stenography project as an improvement over Cherry’s Red and Black linear switches. They boast a smoother and more stable feel thanks to an internal leaf spring that tries to keep resistance at the same level throughout a key press. They’re also quieter than Cherry switches (and even quieter than Matias’ Quiet Click switches), making them ideal for office use or late night gaming. Finally, the switch housing is transparent, making them compatible with (RGB) backlighting. Of course, the new switches also have the traditional advantages of Matias mechanical switches. That includes N-Key Rollover (NKRO) so you can press as many keys down as you like and have them all register correctly, and a rated lifespan of 50 million presses. We’re stocking the switches, and you can purchase as many as you’d like right here if you’d like to include them in a custom keyboard (or replace the switches in your existing keyboard). The switches are also available from Matias themselves for North American customers. Of course, you might think – hey! I want to try these new switches in an actual keyboard that I can just buy. And that’s totally valid – so have a look at Matias’ 60% size keyboard, which will include the new soft linear switches. Why linear switches? Well, clicky or tactile switches are great for pressing a large amount of different keys thanks to their aural and tactile feedback; it’s no surprise that they tend to be slightly favoured for writing and RTS games. For other games like FPS though, where you’re pressing a small number of keys repeatedly, then the softer, smoother action of a linear switch can be better. Choosing a switch is a very personal experience of course, so we encourage you to try the different options available to you rather than feel there’s only one viable option for your activity of choice! 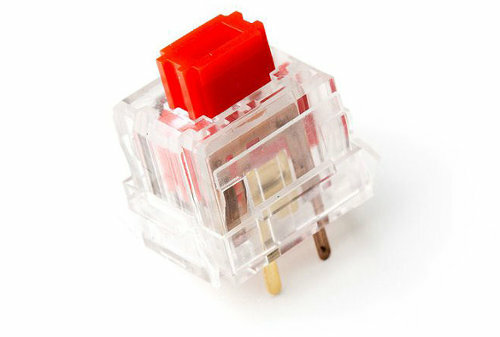 Read more about different Cherry MX switches here; we’ll have a guide to different Matias switches up soon. For years, fans have been asking for a more compact Matias keyboard. 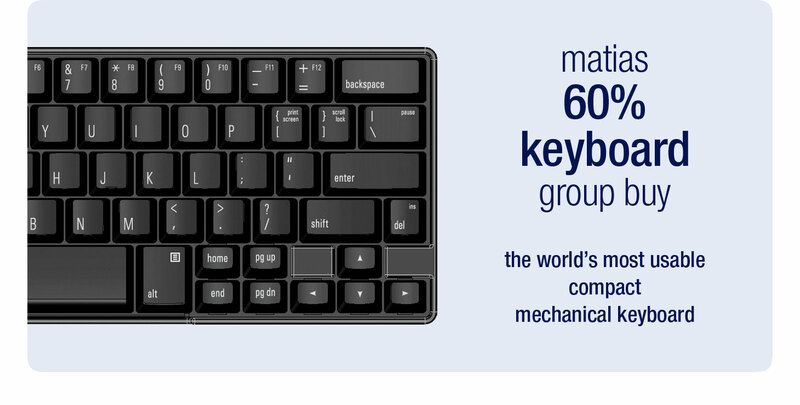 Matias heard their cries and started work on their simply titled 60% keyboard – a keyboard that is about 60% the size of a normal full keyboard. This portable option frees up space on your desk, is better for traveling with and lets you move your mouse into a more comfortable position. Lots of people use keyboards of this size with tablets or laptops, as they’re small enough to sit below the display and don’t add too much to your baggage. Matias are even offering two different versions for Windows and Mac users. Windows users get the navigation cluster and arrow keys, while Mac users get Option and Fn plus arrow keys. You can see the Windows layout on the left and the Mac layout on the right. Best of all, you can change between Windows and Mac layouts with a DIP switch setting, so you can easily use the keyboard with both operating systems. There’s a Group Buy going on right now for the Matias 60%, so if you want to be one of the first to get your hands on one then head over to the 60% page on Matias’ site. There’s a choice of Matias Click, Quiet Click and the new Quiet Linear switches – or you might prefer to buy one without switches, and add in your own Matias or Cherry MX switches. Finally, you can even choose to buy a Matias 60% with a unibody aluminium shell, adding a little weight but providing better durability and an awesome look. If you’d prefer to wait and see how they turn out, then you’ll be able to buy one from us once everything is finished. We’ll update our blog once we have a confirmed date for this, which should be quite some time in the future. So there we have it – two cool new efforts from Matias. It’s important to note that both projects are still in their early stages, so this information can (and probably will) change. We’ll take a closer look at these projects as they progress. We welcome your feedback as always, and we’ll forward on any particularly interesting comments or questions to Matias themselves. Thanks for reading our Matias update!